The only thing required to unregister a machine is to run the unregister command. This removes the system's entry from the subscription service, removes any subscriptions, and, locally, deletes its identity and subscription certificates. From the command line, this requires only the unregister command. Open the Subscription Manager UI. 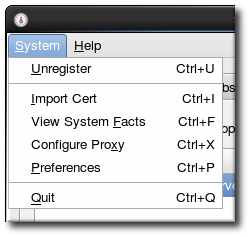 Open the System menu, and select the Unregister item. Confirm that the system should be unregistered.